I haven’t posted much lately because I’ve been obsessed with another creative outlet of mine. Dance, and more specifically hoopdance. I’ve gotten a few new hoops and I haven’t wanted to put them down. I haven’t wanted to do much else honestly. I find dancing to be a place of meditation for me as well as form of exercise and way to play and to be free. 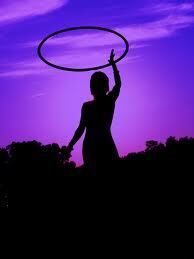 Dancing with a hoop is dancing with centrifugal force as a dance partner. It’s just you and the laws of physics dancing together, the hoop responding to your every move. Best dance partner I’ve ever had. It takes me to a flow state, a place of presence so much more quickly than any other thing I do. It’s also a toy, it’s fun to play with (although the hoops we dance with are bigger and heavier than toy hoops). I have been finding my expression through dance, rather than words, but I started to feel the words plugging up inside me too. I know I need to find a balance, but it always takes me awhile. So, if I’m not posting, blame the hoop, blame work, blame my laziness. But I’ll be back. I have way too much to say to stay away for very long. Thanks! I’ll do the same.